Context: Read this mostly on my way to and from work along this farmer’s track. This is a shorter novel than most Dickens I’ve read but it still contained all the elements that make a great read: a panoply of intriguing characters, industrial blight, injustice, orphans, plot twists and what I love Dickens most for – fantastic cynically-tinged descriptions. The book sets out to attack a number of contemporary evils. There was an awful lot of unjust legislation about which left people in dire straits with no recourse unless they had the means or the contacts to help them out of their predicaments. The industrial labourer in particular was a soulless labour device for many entrepreneurs of the day. 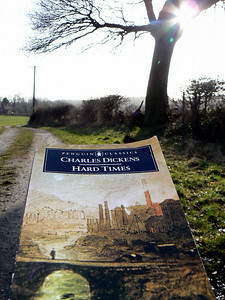 Dickens doesn’t let them off lightly at all in Hard Times. It’s not his best but it’s a good one to read as an intro to Dickens. If it appeals to you at all, then you’ll love the much lengthier Great Expectations or, my favourite so far, David Copperfield. Now, what I want is, Facts. We shall sit with lighter bosoms on the hearth, to see the ashes of our fires turn grey and cold. I wasn’t so thrilled with this one either. I loved Great Expectations though.